Review date: 28 March 2005. I checked out Ultrasone's HFI-550 headphones the other day. Here are the versions with a model number one point one eight repeater times as great. The HFI-650s are very similar to the 550s. So similar, in fact, that this is going to be a short review; the 650s look and feel very much like the 550s, and they come with the same bundled stuff - well, all except fore the 550's little drawstring carry-bag. Apparently 650 users aren't expected to move around as much. The 650s cost more, though. In the USA, you're looking at about $US250 ex delivery for a pair of HFI-650s, versus about $US190 for the HFI-550s. Here in Australia, the 650s are only $AU299.20 including delivery anywhere in the country, from Aus PC Market. $AU299.20 is, as I write this, worth about $US231 (take a bow, masterful Republican fiscal managers! ), so the Aussie price looks like a bargain. If, of course, these headphones are actually any good. The 650s have some silver-grey plastic on the ear-cups (possibly to make sure the Ultrasone packers put the right 'phones in the right boxes), but there's nothing else to obviously distinguish them from the 550s. They're the same size, the same weight, fold up in the same way, have the same chunky cable and gold eighth-inch plug with screw-on quarter-inch adapter, and come with the same entertainingly fractured manual and CD of mildly interesting test tracks. The 650s have 75 ohm impedance instead of the 550s' 64 ohms, which should make pretty much no difference to anyone. The 650s have marginally lower efficiency as well as their higher impedance, so they'll play perceptibly quieter for a given volume control setting and might not manage acceptable volume from devices (like portable players) with lousy headphone driving circuitry. But there ought not to be any serious issues; these certainly aren't fussy audiophile headphones with very high impedance and pretty low efficiency, which you're unlikely to be able to drive to respectable volume without an add-on headphone amplifier. The 650s also have the same peculiar marketing spiel as the 550s. As with the 550s, they're meant to have extra-low electromagnetic emissions. This might perhaps matter, but probably means nothing at all even if low energy electromagnetic radiation is much more dangerous than the current scientific consensus says. I rambled on about this in the last review. And, as with the 550s, the 650s are promoted as having "S-Logic" technology - off-centre drivers in the ear-cups that're meant to give a more spacious, less "headphoney" sound. I discovered that the drivers in the 550 ear-cups are, actually, positioned right in the middle, as with any other ordinary pair of headphones; it's the grilles for the 550 drivers that're off-centre. ...reveals that the drivers actually are off-centre, this time. They're offset in the same direction as the grille. Oh, and the cable's soldered on, as with the HFI-550s. 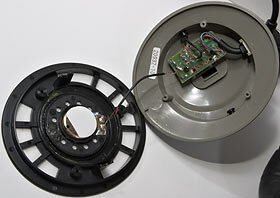 It looks robust enough to handle considerable abuse, but if you do need to replace it, you'll have to melt some lead. 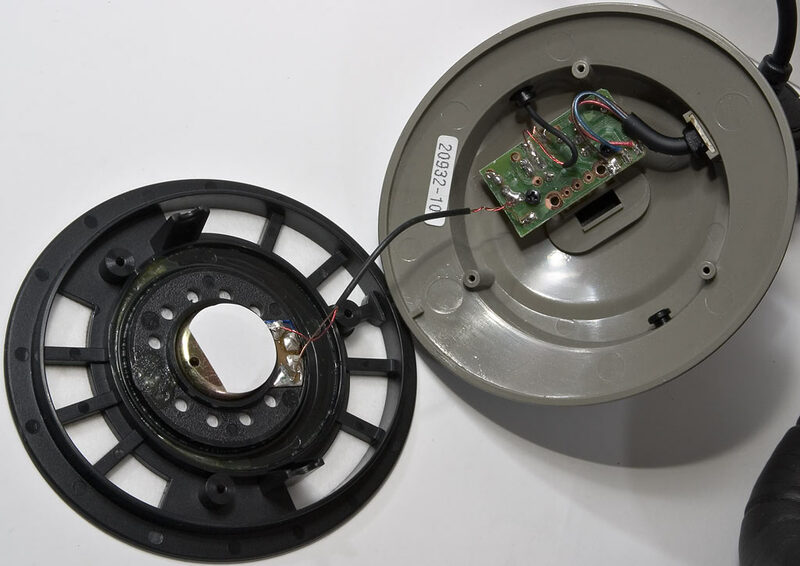 The HFI-550 driver assemblies have an interesting "ported" design, presumably to help them achieve the phat bass response that's one of their selling points. The 650s are unported; these headphones are meant to have a regular, neutral frequency response, and Ultrasone's official specs for them say that they only go down to 15Hz, instead of the 10Hz limit of the HFI-550s. As I said in the HFI-550 review, these numbers need to be taken with a quite gigantic grain of salt. Practically nothing you listen to is going to have significant bass content below 20Hz, to start with, and the response of all normal headphones (and speakers) at very low bass frequencies is generally so very many decibels down that it's misleading to quote bass figures like this. Everybody does it, though, and most consumers don't know any better, so even well-respected headphone and speaker companies often quote silly bass response numbers, just so they can sell stuff to the great unwashed. Listening to some bass test tracks with the 650s revealed that they indeed don't have the prodigious bass response the spec sheet suggests. Their bass also isn't as prominent as the HFI-550s', as you'd expect. The 650s certainly don't lack bass, though, and I can't find much to complain about in the midrange or treble departments, either. I whipped through my usual test tracks, and as with the 550s, the 650s didn't sound very "sealed". They've got the isolation (external sound blocking) of a sealed headphone, all right (and, like the 550s are very quiet with the ear-cups pressed together; good for studio applications, trivia for everyone else), but it's normal to hear some noticeable midrange resonance from sealed headphones, and there's little enough of that. As with the 550s, the "S-Logic" offset-drivers thing gives the 650s an unusually wide stereo soundstage. Ultrasone insist that this effect is a great breakthrough in headphone design; I think this is just more of their marketing hyperbole. I don't think I'm so much of a victim of psychoacoustics as to hear a difference where none actually exists, and I also feel pretty confident in saying that it's not a bad effect, but frankly, I can take S-Logic or leave it. If you listen to a lot of material with tons of stereo separation - old rock'n'roll with half of the band in one channel and the other half in the other is the most extreme example - S-Logic is really going to make you want some kind of crossfeed processor (I talk about that in my BitHead review) to stop the two halves of your brain from falling apart. For most material, though, S-Logic is thoroughly unobjectionable, at worst. Wandering on through the land of random play, I kept being impressed by the HFI-650s. Classical, jazz, cyborg music, live'n'freaky, electronica that's painted with such a broad brush that it actually does include air raid sirens and/or sonar pings; no problem. Oh, and I whipped through the holy Substantial Gentleman, Diminutive Pastry at OSHA-unapproved volume, and was most satisfied with the result. Like the HFI-550s, the 650s are a bit fatiguing to wear for long periods, because of the standard sealed-headphone head pressure problem. A headphone can't seal to your head without pressing on it harder than an "open" headphone would. My AKG K 271s remain the most comfortable full-sized sealed headphones I've got, but they don't attenuate outside noise as well as the 650s, and they've got thinner bass, too. If you want headphones that float on your ears like a cloud, you're going to have to buy an open model, and just put up with outside noise leaking in and your music leaking out. 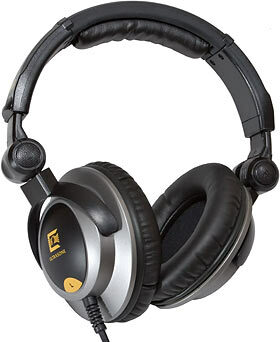 But if you don't have unusually large or sticky-out ears, you should be OK with the comfort of the HFI-650s. 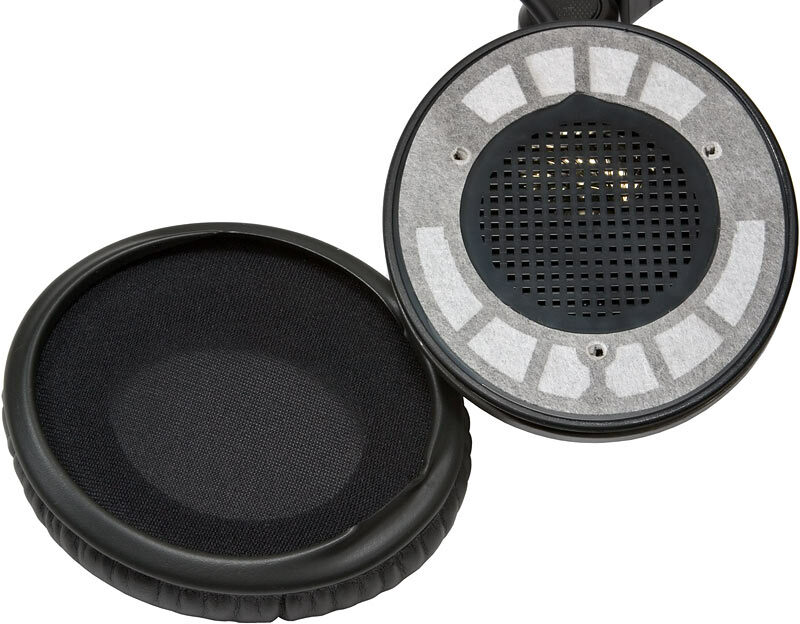 Between them, the HFI-550 and HFI-650 cover everything most people want from a sealed headphone. If you like the idea of more bass, less fidelity, but don't want some ridiculous sci-fi object marketed to cloth-eared teenagers, then the 550s fit the bill nicely. The 650s have a more traditional hi-fi frequency response; if you don't need more low-end oomph - or actually are doing studio monitoring - then they're better. The price difference is significant, but not enormous; for a solidly constructed, good sounding, Made In Germany headphone like this, the HFI-650s really are quite a bargain - even if you're not lucky enough to be paying the current cheaper-than-the-States Australian price. Aus PC Market no longer sell the HFI-650s, though they do have the more expensive "Proline" version. I don't think those are actually any better - see this review). Fortunately, they've got a lot of other headphone options!